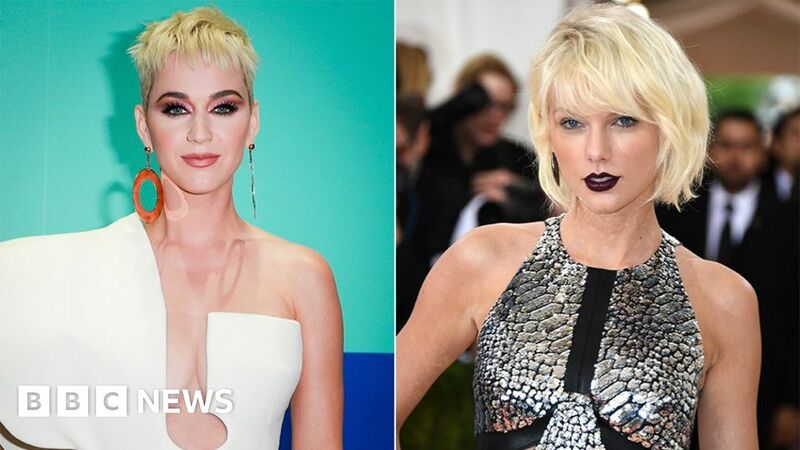 Katy Perry has sent Taylor Swift an actual olive branch, seemingly ending the beef between the two megastars. Swifty, who is about to start her Reputation tour, shared a video of the package she received from Katy – which appeared to include a note with the words “miscommunications” and “deeply sorry” written on it. The olive branch is a symbol of peace. The pair reportedly fell out in a row over backing dancers, before writing songs about each other. Taylor’s Bad Blood is thought to be about Katy, while Swish Swish is said to be about Taylor. Taylor’s Instagram story shows a package containing an olive branch and a written note that opens: “Hey old friend”. “I just got to my dressing room and found this actual olive branch,” Taylor said in the video. Trying to figure out exactly what the note says is a bit of a tougher job though, as fans noted. The two haven’t been friends since at least 2014, when rumours emerged before the release of Taylor Swift’s hit Bad Blood. Straight after that article, Katy posted a cryptic tweet about Regina George – the villain of the 2004 comedy Mean Girls. “Watch out for the Regina George in sheep’s clothing,” she tweeted. Katy spoke about the tension between the two stars in a Carpool Karaoke interview with James Corden. “She started it, and it’s time for her to finish it,” Katy said. Katy then apologised to Taylor during a 24-hour YouTube live stream ahead of her album Witness being released last year. “I’m ready to let it go,” she said in an interview. And after what finally looks like a mended friendship, fans celebrated with some tongue-in-cheek tweets.